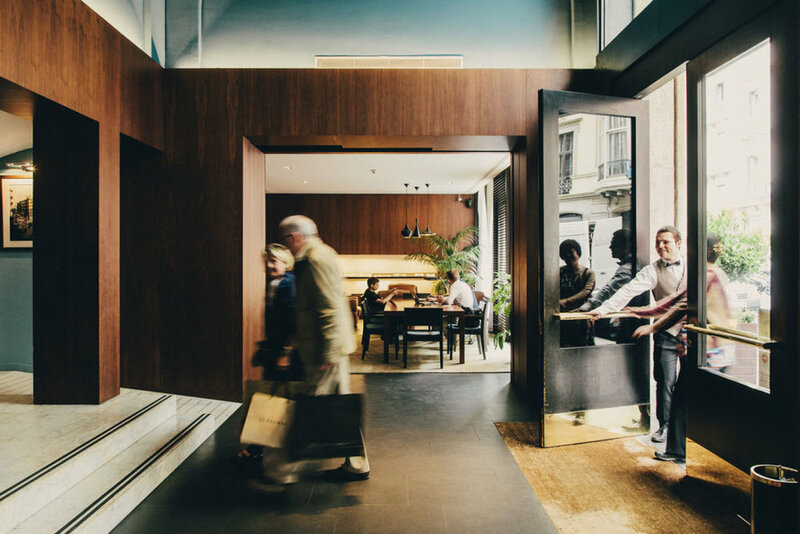 Hotel Regina is a 4* Hotel located right in the Center of Plaza Catalunya. Most of the hotel guests are middle class families and couples travelling from the US. The intention was to make the people feel home from home, creating a warm and comfortable atmosphere, like you have in classical bars in big cities like New York or London. We divided the ground floor into reception area to the left of the entrance hall, and lounge including a bar, with a big working desk to the right. Walls are cladded in walnut to form a rich and warm background, or padded. Materials are chosen to reach sufficient soundproofing for a calm ambience. The floor is either laid out with ceramic tiles, wooden parquet, and carpets to zone the various areas within the space. We chose a range of modern furniture in mid century style, a selection of vintage maps, and accent color cushions to create a timeless and worldly atmosphere. The lighting has been designed to create a warm and rich atmosphere by a mix of indirect low-level lighting, spots, and decorative lighting.